April: attended our first Ring Meeting with some trepidation. We hadn’t far to travel as the meeting was hosted by Manchester Morris Men but were slightly in awe of more established sides. We analysed every comment overhead about our dancing but were uncertain what to make of Father Kenneth Loveless’s remark that our Headington was ‘brisk but not too energetic’! June: we were invited to a 17th Century reenactment at Lyme Park where our kit seemed to fit well with the occasion. 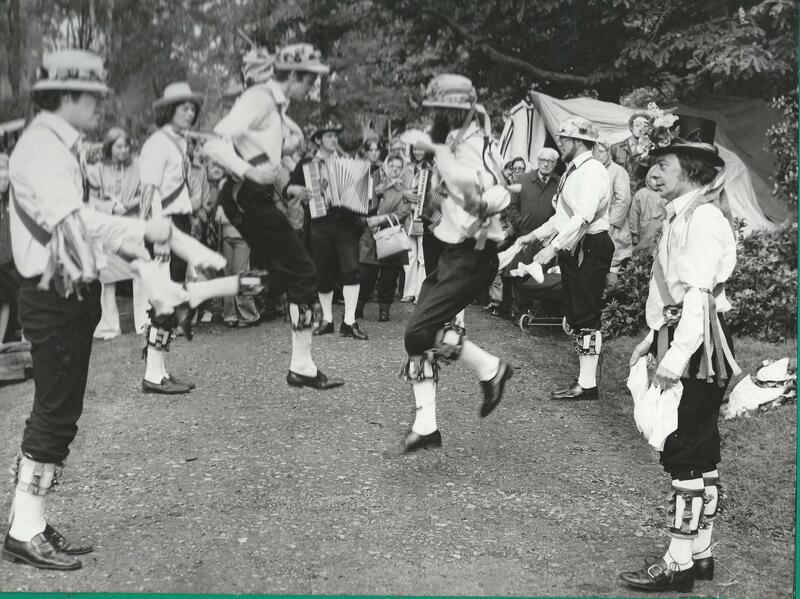 July: An invitation to dance with Poynton Jemmers (the beginning of a long-standing friendship), our first performance at Chapel-en-le-Frith Carnival ( a very long procession) and another trip to Sidmouth International Folk Festival to build up our dance repertoire. August: attended our first Saddleworth Rush Cart. What an experience! October: Founder member, Peter Helps’ wedding to Lin. Danced at ceilidh reception at the Railway Inn, Buxton. Peter danced solo jig ‘Ladies’ Pleasure’.